Andrea Davis Pinkney and Brian Pinkney are two of my favorite people in the world. They are inspiring and talented and kind. 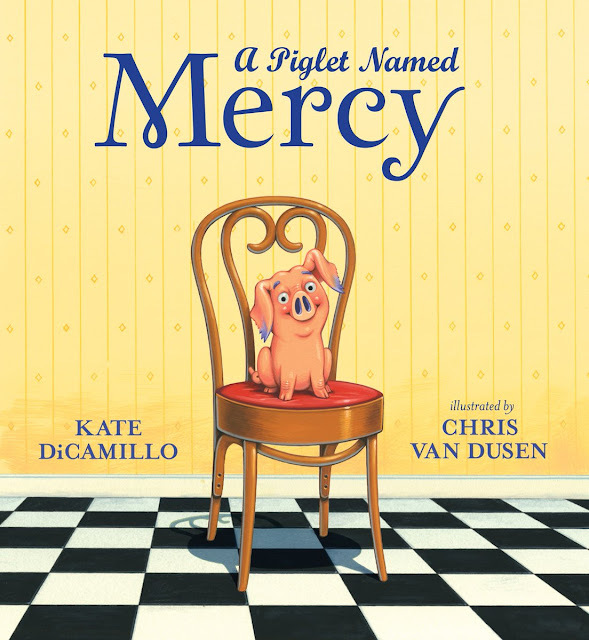 Their books inspire readers to make this world better, brighter. I am honored they dropped by to share the cover for Martin Rising: Requiem for a King and to finish my sentences. I wrote the words in purple, and Andrea and Brian wrote the words in black. Thank you, Andrea and Brian! Brian Pinkney says. . . The cover illustration for Martin Rising: Requiem for a King arrived in my mind’s eye like a quiet, powerful storm. It was as if Martin’s essence was guiding my hand as I painted. Inspired by the work of artists like Chagall, and abstract expressionist Norman Lewis, I was flooded with emotion as my paintbrush played with color and form. The cover is rendered in watercolor, gouache, and ink. My hope is to depict the soaring spiritual heights of Martin’s life that inspired all of us to rise to our greatest selves, while at the same time, rejoicing in the feet-on-the-ground dedication of so many protesters who marched for equality during the Memphis sanitation workers’ strike, the final civil rights movement Martin led before his tragic death. Andrea and I try to fill each and every book we create with the most powerful force in the world — love. This is especially true for Martin Rising, a book that celebrates the love Martin had for his wife, Coretta, and their children, but also the admiration he instilled in the hearts of the human family. As husband and wife collaborators, Andrea and I begin each project by tapping into the deep devotion and respect we have for each other and for our own children and family. We let that energy serve as our creative guide that is expressed through words and illustrations. Andrea’s historical “docu-poems” burst forth throughout Martin Rising. As soon as I read them, I knew that I wanted to punctuate her nonfiction narrative with paintings that convey the metaphorical impact of Martin’s mission. 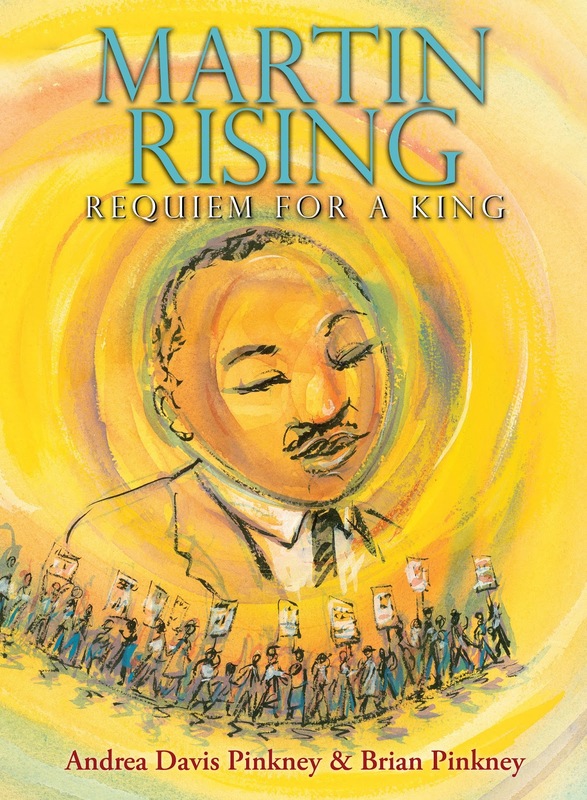 Brian created the illustrations for Martin Rising: Requiem for a King with a heart full of hope. Yes, that’s my husband — an artist who pours his entire soul into his artwork. When he brought home the cover painting, I could immediately see that so much emotion had been plunged into his brushstrokes. I knew this cover image had come from something deep within Brian. I was so moved by the cover’s exquisite beauty, that I honestly could not find the words to thank my husband. And, so – I simply hugged him, and held on for a long moment. Brian’s cover, and his paintings throughout the entire book, glow like stained glass windows infused with light, color, luminescence. Brian and Andrea say. . .
April 4, 2018 marks the fiftieth anniversary of the assassination of Martin Luther King, Jr. But that date also presents an opportunity to reflect on the power and spirit of the men, women and children who lifted Martin and his movement to their highest heights – and still inspire us today. Mr. Schu, you should have asked us how we’ve stayed happily married for nearly 27 years while working together. The answer is simple: 1) Separate work-spaces (Brian’s studio is miles away from home); 2) Focus on what’s truly important – creating the best books we can; 3) Laugh a lot; 4) Never discuss work during family dinners, holidays, or vacations. Martin Rising: Requiem for a King by Andrea Davis Pinkney; illustrated by Brian Pinkney | Publication date: January 2, 2018. In a rich embroidery of visions, musical cadence, and deep emotion, Andrea and Brian Pinkney convey the final months of Martin Luther King's life -- and of his assassination -- through metaphor, spirituality, and multi-layers of meaning. Andrea's stunning poetic requiem, illustrated with Brian's lyrical and colorful artwork -- brings a fresh perspective to Martin Luther King, the Gandhi-like, peace-loving activist whose dream of equality -- and whose courage to make it happen -- changed the course of American history. And even in his death, he continues to transform and inspire all of us who share his dream. Wonderful classroom plays of Martin Rising can be performed by using the "Now Is the Time" history, and the 1968 timeline at the back of the book as narration -- and adding selected poems to tell the story!